they believe on maatam ,which is truly haraam in Islam ...they think tht our Quran is incomplete [tauba astagfar] ,they abuse our sahabis especially the first three..
We do mata,m on the 21 of ramazan yes we do why you are so in pain??? Imam Ali a.s. ah ah ah you bliind people would never understand him ok read this ,, your book ahle sunni high and great book Sahi Bukhari,,, Prophet says,, Ya Ali Anta Minni Wa Ana Minka, ya ali tu muj se hain or main tuj se hoo,,, so what is it meann refuse it can you ?? ?/ do it i dont care thats what you do ? Before advising anyone,first of all u shoul do by yourself.Your peaope are really in state of insanity.You cannot understand by yourself,what your are sayng. Your are the immodest people who alwasys use blesphamous words against Holy Prophet(saw),Sahaba e Kram Radi Allah o Unhum Ajmaeen,Ahl e Bait Athaar.You are the main and real criminals of Karbala. When we say anything against your own personality,you start to bark,but when you use abusive language against Sahaba,why u dont fear from Almighty ALLAH???? Now you are hitting Imam Bukhari(ra),first of all tell me what is your status in Ilm e Hadith? ?You even dont know who r your parents?? ?Because Mutta(temporary marraiage and in literal words Zina)is allowed in your religeon. I think by using your own words,no one can say that this is the proof.In your post you have not given a single refrence from any authentic book.And shut your abusive language language against Sahaba here. God is almighty i have the most hight respect of fair for God For Quran and For allk Prophets first one to the end ,, and we obay them as much as the Quran says and we Believe them and respect them as much as the Quran says ,, is this one clear to you??? And again,, if you were faithfuill muslim you would never talk about my perants ,, as you have perants as well this is so pain fulll for me that today a muslim is acusing my perants in a chat forum ,,, this is out of order,,,,,,,in reply this is my answer to you may God bless you and your Perants all the time,, and keep them away from all illness pain and troubles,,, A,meeeenn,,,,, this is shiaa believes ad mind,,,,,,brother.,. REfuesal ,,, We and i Refuse , anyone who has been unfaithfull to God To Quran To Prophet or To Ahlebeith,,,,,,, do you people think this is wrong,, ?? i never tried to abuse Buikhari,, come on did i say that? no i did not i just gave a reference from Bukhari book so what is wrong that i did here?? tell me why you saying i am hitting Bukhari??? i have this book i read this book comeon i am a student not a stupid person,, if you say giving refernces from Sahi Bukhari is a affence then i say i am sorry you are wrong,, if not then think again and come back here . Notice the phase istamtaa’atum! Now remember this word! 4:24 Also (prohibited are) women already married, except those whom your right hands possess: Thus hath Allah ordained (Prohibitions) against you: Except for these, all others are lawful, provided ye seek (them in marriage) with gifts from your property,- desiring chastity, not lust, seeing that ye derive fulfilment from them, give them their dowers (at least) as prescribed; but if, after a dower is prescribed, agree Mutually (to vary it), there is no blame on you, and Allah is All-knowing, All-wise. The pro mutah lobby insist that the word istamtaa’atum does not really mean istamtaa’atum but means mutah. They say this because the two words sound similar and they have the same Arabic root. To prove their point they select some sunni references that they say give credence to their argument. So in their mind the two words - istamtaatum and mutah – mean the same thing and are interchangeable. To start let us look at what these two words mean literally in Arabic. Mutah is a noun meaning ###### CONTRACT. The pro-mutah lobby claim that as Muslims we are also allowed to do this, especially with widows and divorcees. They claim it is kindness to do this with widows and divorcess because they need sexual release from men who want them for a ######. Ahle sunna ke khilaf bus Allah se ye Dua karni chaye he ke Allah is fitne ko khatam kare chald se chald Ameeen. Just to clear your mind we are not against Sunni ok ,, we love all muslims,,, ok ,,,,,,,,, ,,, we dont accept those who has been unfaithfull and has been trying to hurt the Prophet and Ahle beith,,,, is this clear,,,, you people come from anywhere and say things about shia why is that????? Mr,Lashari did you believe in this Aya if you do then, to whom Allah is discribing as a companion? 1. CAN YOU PLEASE SHOW ME THE NAME OF HAZRAT ABU BAKR ( RA) IN THIS AYAT??? 2. SUPPSOE IF FROM THE HISTORY BOOKS WE BELIVE THAT THIS AYAT IS ABOUT HAZRAT ABU BAKR ( RA) , CAN YOU PLEASE TELL ME THAT THE WORD "SAHABI" IN ARABIC ONLY AND ONLY MEANS GOOD PERSON ??? 3. SUPPSOE FOR THE SAKE OF DEBATE WE ACCEPT THAT THIS AYAT IS PRAISING THIS DEED OF HAZRAT ABU BAKR ( RA), BUT HOW CAN YOU SAY THIS IS THE GUEARANTEE THAT HAZRAT ABU BAKR ( RA) WILL NEVER DO BAD DEED IN THE END?? dosra shia ap na begrati ka muzara karte huye "suppose if" ka lafz use kia Tamam Ulamah-e-Ahlesunnat ka itefak ha ka ya ayat Hazrat Abu Bakar(R.A) ka bare main ha. aur ap bata do kis kitab main lika ha SHABI mazALLAH kisi BAD PERSON ka leye b us hota ha.ALLAH ka Shukar ha mare NABI Kareem Muhammad-e- Arabi Sallahoalayekawasalam na guearntee di ha ka ABU BAKAR jannati ha. Aur ap bata be do saroun ka tum SHAI MUTTE KI PADAWAR ha. mager takia tum chor nahi sakte . OFOOO ISS TOPIC KA NAAM, TO PARHO KIA HAI??? AOR HAZRAT ABU BAKR ( RA) , JANATI BANE HI ISSY WAJA SE KE, HAZOOR PAAK ( SATAWAW) AOR HAZOOR PAAK ( SATAWAW) KE HAZRAAT-E AHL-E-BAIT ( SATAWAW) KI GHOLAMI KI. OSS BANDE SHIOON KO KAFIR SABIT KARNE KE LIYE JO AYAT DEE, OSS SE KAHEEN YE SABIT NAHI HOTA KE, HAZRAT ABU BAKR ( RA) KO NA MAAN-NE WALA KAFIR HAI. WOH SIRF GHAR KE WAQEAH KA BIAAN HAI, AOR HAZRAT ABU BAKR ( RA) KI SHAN KI EK AYAT HAI. SAHABA ( RA) KE FAZAEL KI AYAAT BOHT SEE HAIN ONPE IKHATALAF BHI HO JAYA KARTE HAIN, ISS SE JAANT JAHANAM KA FAISLA KAHAN SE AA GIA..
AOR AAPNE BOLA KE WORD "SAHABA " KA SIRF EK HI MATLAB HAI, YANI "ACHA BANDA"
QAYAMAT KE DIN MERE SAHABA KO FARISHTE JAHANAM KI TARAF LE JAIN GE ( YA HOZE KOSAR SE HATA DIA JAI GA) MAIN KAHOON GA AAI ALLAH ( AJ) YE TO MERE SAHABA HAIN ALLAH ( AJ) KAHE GA KIA AAP ( SATAWAW) JANTE NAHI HAIN KE INHOON NE AAP ( SATAWAW) KE BAAD KIA KIA KAAM KIYE? PATA NAHI YE BIDATTT KAB SE LOGOON NE NIKALI HAI KE, SAHABA KO NA MAANE SE KOI KAFIR HO JATA HAI??? SAMJH NAHI AAATI LOG NAI SE NAI BIDAT NIKAAL KAR LE AATE HAIN, ... HAAN NAA MAANNE WALA GONAHGAR HAI MAGR KAFIR KAHANS E HO GIA?? SAHABA ( RA) ISLAM THORI HAIN, WOH KHOD ISLAAM LE KAR AAE, ONKO KHODKO ISLAM KI ZAROORAT HAI, WOH ISLAM TO NAHI..
HAZOOR PAK ( SATAWAW) NE KAHA, TERA PEER KAB SE ISLAM KE LIYE ZAROORI HO GIA? WO MOJHAY MANTA HAI KIA YEH KAFI NAHI TERE LIYE. AGLE DIN HAZRAT IBNE ARBI ( RA) NE JA KAR OSKO MANA LIAA. ISS LIYE MOJHAY SAMJH NAHI AATI, KE 1 LAKH 40 HAZAR SAHABA KAB SE ISLAM BAN GAE, WOH KHOD ISLAM LAANE WALE HAIN WOH ISLAM TO NAHI.. ONN MEINS E BAAZ BADAL AGE RASTE SE AOR SAHI BOKHARI KE MOTABIQ JAHANAMI HO GAE. Hum Ahl-e-Sunnat k nazdeeq Ummahat-ul-Momineen, Sahaba-e-Kiram ya Ahl-e-Bait mein se kisi ko bhi bura kehne, gaali dainey ya unhain Kafir kehne wala khud Kafir hai. agar aap ko in logon k baaray mein koi shak hai to in logon ki kitaabein padh lein keh Ummul-Momineen Hazrat Ayesha Siddiqa Tahira ( R.A) k baaray mein ya Farooq-e-Azam Hazrat Umar ( R.A ) k baaray mein ya deegar Sahaba-e-Kiram k baaray mein in logon ne kitnay ganday alfaaz istima'al kiye hain. Azmat-e-Sahaba ( R.A.) se muta'alliq yeh padh lein, Insha-Allah ifaaqa hoga. Kiya jin per ALLAH ki La'anat ho woh musalman rahega??? OSSBANDE SHIOON KO KAFIR SABIT KARNE KE LIYE JO AYAT DEE, OSS SE KAHEEN YE SABITNAHI HOTA KE, HAZRAT ABU BAKR ( RA) KO NA MAAN-NE WALA KAFIR HAI. WOH SIRF GHARKE WAQEAH KA BIAAN HAI, AOR HAZRAT ABU BAKR ( RA) KI SHAN KI EK AYAT HAI. Aur dosri tafr ya ikrar karte ho ka ya ayatShan-e-Sidiq Akbar pa nazil huyi thi to is say a sabit huya ko Shan-e-SidiqAkbar Quran ki is ayat sa sabit ha to pakisantishia sab ya farmayen ka jo QuranKi ayat ko na mane wo kia musliman ha wah wah ki logic ha tumhare . SAHABA( RA) KE FAZAEL KI AYAAT BOHT SEE HAIN ONPE IKHATALAF BHI HO JAYA KARTE HAIN ISSSE JAANT JAHANAM KA FAISLA KAHAN SE AA GIA..
Achakia iktelaf ho jaya karte hain humhen be to batyo shia sahb sirf Shaba ki shanwali ayat sa iktelaf ho jate hain wah kia logic ha . 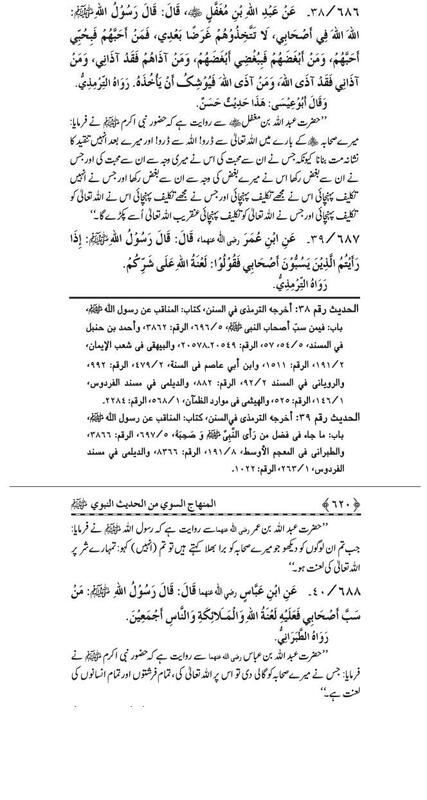 Dosra ager Quran Shareefki ayat sa janti aur jahnmi hone ka fasila nahi hota to pahr kahan sa hota haya be irsahd farmayen. HAANOSS BANDE NE YE KAHA KE, KIONKE ISS AYAT ME WORD "SAHABA" LIKHA HAIISS LIYE SHIAH SAHABA KO NAHI MANTE ISS LIYE SHIAH KAFIR. Usbande ki bat samje ha kia tum na masla ya ha ka Quran Shareef main HazratSiddiq Akbar(R.A) ka leye lafz”Sahib” aya jahil insan jo shaks HazartSiddiq-e-Akbar ki shabeast ka inkar karta ha means ka wo Quran Majeed ki isayat ka inkar karta ha aur jo quran ki ayat ka inkar kare wo kai hota ha? Shaiounka nazdeek to musliman ho sakta ha Ahl-e-Sunnat ka nazdeek nahi samj ayi. Achaya batayo Ayat main jo lafaz “Sahib” ayaha wok on sa mane ka leye aya ha ya bat ho rahe ha ache ya bure? Aur zara mujearbi garmmer sa be dekane ka SAHABA burebande ko be kahte hain theik ha na. achaya Hadis jo ap na beyan farmi aur is ka mafoom jo ap na beyan kar kaSahab-e-Keram pa atek karne ki kosish ki is mafoom ko zara Ulahm-e-Ahesuunat sabe sabit kar do.samaj ayi . PATANAHI YE BIDATTT KAB SE LOGOON NE NIKALI HAI KE, SAHABA KO NA MAANE SE KOI KAFIRHO JATA HAI??? SAMJH NAHI AAATI LOG NAI SE NAI BIDAT NIKAAL KAR LE AATE HAIN,... HAAN NAA MAANNE WALA?? Ya kahan sa paher liatum na zara muje be samjayo. HAZOOR PAK ( SATAWAW)NE KAHA, TERA PEER KAB SE ISLAM KE LIYE ZAROORI HO GIA? WO MOJHAY MANTA HAI KIAYEH KAFI NAHI TERE LIYE. AGLE DIN HAZRAT IBNEARBI ( RA) NE JA KAR OSKO MANA LIAA. ya likne ka muje maksad samj nahi ayat bat Sahab(R.A0 ki ho rahe hapeer-o-murshid ki nahi jahil insane kud kahn ki bat kahan la ate ho ya topic sarealted ha kia? ISSLIYE MOJHAY SAMJH NAHI AATI, KE 1 LAKH 40 HAZAR SAHABA KAB SE ISLAM BAN GAE,WOH KHOD ISLAM LAANE WALE HAIN WOH ISLAM TO NAHI..
ONNMEINS E BAAZ BADAL AGE RASTE SE AOR SAHI BOKHARI KE MOTABIQ JAHANAMI HO GAE. Tumhen samj be nahiaye gi pakisatni shai shab. Kinun main sa? Is hadis pa Ulamah-e-Ahesunnat na kafi bah ski ha is hadis kotumhare bahi deogandi NABI KAREEM(S.A.W) ka admeilm pa pash karte hain aur tumlog mean shia SHABA(R.A) ka kelaf.samaj ayi ka nahi . Aurshioun ko tum kia samjte ho musliman ka kafir zara ya be bata dana? BHAI QURAN KAHTA HE KE ALLAH NE HAME MUSALMAN BANAYA HE OR KAHA HE,OR YE BAD BAKHT KHUD KO KAFIR KAHTA HE TO BATA KON HOWA ABU JAHAL ? Wah Wah Janab aaj yeh video dekhi toh yakeen ho gaya ke Gustakhon ki Aqlain phir jati hain . kaisay cheekh cheekh ke apnay aap ko Kafir keh rahay hain Fakhar se koi Sunni aisa soch bhi nahin sakta balkeh hum log toh itni Aehtiyat kartay hain khud ko toh kya kisi doosray ko bhi tab tak Kafir nahin boltay jab tak ke uska Kuffar Waziyah na ho jaye aur yeh janab zara dekhain inko yeh kitna Fakhar se apnay aap ko cheekh Cheekh ke Kafir keh rahay hain . o Bhai ab jab khud apnay aap ko Kafir kehtay ho toh doosra tumhain kahay toh kiyun aag lagti hai ? ek baat toh batao Jab farishtay qabar mein tumhara Hisaab lein ge aur jab poochain ge bata tera Din kya hai toh kya udhar bhi yehi kaho gey ? ab zara ek minuet khud hi yeh baat bata dein Abu Jahal kon tha ?? Kafir na ? ab aap batain kon hua AbuJahal ka Sathi ?? khud hi iqrar kartay hain khud hi behas kartay hain humaray Punjab mein aison ko kehtay hain " Lagda hai Phir Gaya wey "
First of All Jo Quran Pak kaa Inkaari hay Wo Kaafir hay, Sahaaba ki Shaan Quran e Pak main. Bhaiyon, Ap aik dam sy dusron par charh dorte hain jb k rasool e khuda s.a.w.w. ka farmaan hy k agar kisi sy behes karo to ahsan tareeqy sy karo or har aik ko apni baat kehne ka moqa do. Abusive language use na karo. Apne arguments polite rakho takay kisi ki dil aazaari na ho. Jo daleelain ap de rahy hain musalmanon k kaan in ko sun sun kar pak chuky hain lekin afsos k ye baten jahil olama ny logon k zehnon mein daal di hain jin me koi wazan nahi hy. Wo chahte hain k pakistan ko musalmanon k liye jahannum bana dain or shia sunni k jhagry sy hamari taqat ko khtm kar dain. Allah (j.j) ki qasam, shia or sunni 2no he islam ki taqat hain. Agar taa'sub ki aenak hata kar dekhen or tehqeeq karen to ye bat waazy ho jae gi k shia kafir nahi hain. And yes me khud shia nahi hun but mre neighbour me shia rehte hain. Kaheen ye na smjhen k mein unhen advocate kar rahi hun. 1. Na he un k or hamary quran me aik lafz ka farq hy. 2. Na he wo sahaaba karam r.a ko galiyan dete hain (chand jahil log hain jo tareekh sy na aashna hain or suni sunaai baton par bolne lag jate hain). Kia ap log un 2 takay k olama jinhon ny 3 din tableegh attend kar li un k fatwon ko ankhen bnd kar k hujjat tasleem kar lain gy or khud tehqeeq nahi karen gy? 3. Questions py question puchne k bajae or aik dusry ko taane dene k bajae puche gae questions ka answer dain. Kisi ki dil azaari na karen please ye saazish hy jo ap k zehnon mein ajib o gharib baten dalte hain. Na he un ki koi haqeeqat hy or na he logic. Reh gai baat moavia (r.a) ki to kon kon ye janta hy k Moavia usi aurat (Hinda) ka beta hy jis ny hazrat e hamza (r.a) ka jigar chabaaya tha or un k jism k aaza kat kar us ka haar bana kar pehna tha?? Bhaiyon, insaf kren. Rasool (s.a.w.w) ko dukh dene wala jannat ki khushbu bhi nahi sungh sakta. Mene khud apne neighbour bhai sy es baary me baat ki or unhon ny kaha hum sirf unhen he sahaaba maante hain jinhen aap (s.a.w.w) ny khud apna sahaaba kaha hy. Na k wo jo apne apko un ka sahaabi smjte hain. Un ko bura kehte hain jo sirf nam k sahaba thay. Or us ki daleel mein unhon ny 3rd paara 1st aayat sunai. "Allah ny rasoolon mein baaz ko baaz par fazilat de di hy"
Or phir kaha k jab rasool aik jese na ho saky to sahaba aik jese kese ho skte hain??? Ye talkh hy but es haqeeqat ko tasleem karna pare ga k kuch aisy log thay jo ap (s.a.w.w) ki sohbat mein bethte thay lekin un ka kirdaar sahaaba wala nahi tha. Please one sided ho kr sochne k bajaae es haqeeqat ko tasleem karen. Tamaam sahaab aik jese nahi thay. Kyun es baat ko nahi maante k sahaaba insan hain aasman sy utry huey farishte nahi. Finally Hazrat abubakar siddique (r.a) or baqi 2 khalifa e rashideen ko shia usi trha khalifa maante hain jis trha aap. Farq ye hy k wo "Moroosi" khilaafat Hazrat Ali (r.a) ki tasleem karte hain or duniyawi hamary 3 khulafa ki. I request you k khud parhen or tehqeeq karen na k kisi ki kahi suni hoi baton par yaqeen karen. Ye baten saalha saal sy chali aa rahi hain. Afsos hy k mere bhai in choti choti baton par aik dusry k dushman bn jaen. Mri koi bat buri lagi ho to maaf kar dijiye ga.
zara is forum per ghor se topics mulaahiza keejiye, in ki apni kitaabon se references mil jaaeynge in k ganday aqaaid-o-khayaalat k.
aik link ref k liye de raha hoon baaqi khud hi forum ko khangaal lein or agar waaqai shia nahin hain to apne iman ki hifazat karein. jo log Ummul Momineen Sayyeda Tahira Aaysha Siddiqa ( Radi Allah Anha ) ko qabar se nikaal ker un per fard-e-jurm aaid ker k saza dene ki baat kertay hon, jo log Sayyeduna Hazrat Umer Farooq-e-Aazam ( Radi Allah Anhu ) jaise jalil-ul-qadr sahabi ko apni kitaabon mein (Nauzu Billah ) zandeeq likhte hon woh musalmaan nahi ho sakte hargiz nahi ho sakte. yeh log taqayya ( jhoot ) ko apne mazhab ka hissa maante hein isi liye ye apne ko accha saabit kerne k liye bay-daregh jhoot bolte hein is k liye chaahe kisi ki qasam hi utthani parray. agar waqaee jaanna hai to is forum per in ki apni kitaabon k scan ref. se hi haqeeqat waazeh ho sakti hai warna to ALLAH hi hafiz hai.